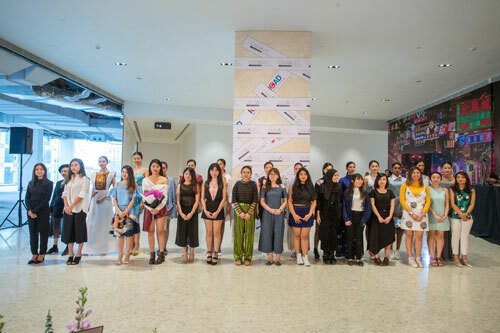 INTI International College Subang’s Center of Art & Design (ICAD) students returned to the runway recently to showcase their stunning designs to the public, media and industry elites. Titled Unravel, the INTICHANGE 03 Fashion Show featured the works of fifteen Diploma in Fashion Design students who took the runway with their designs. They have been selected to present a collection of four original outfits, designed under their chosen concepts. 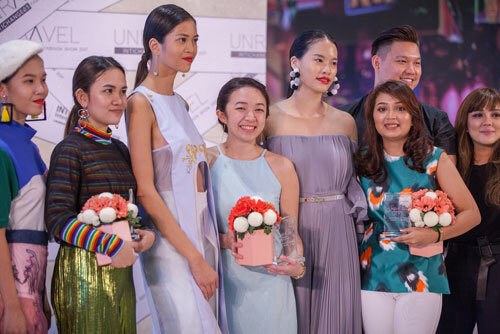 INTICHANGE 03 Best Design Awards winners with their models (second from left) Anis Sofhea Widuri, (fourth from left) Elaine New, (third from right) Lily Farisha with judges on her right, Justin Yap and Nurita Harith. Known for its excellent reputation for producing stars of the future, the annual fashion showcase, also known as INTICHANGE has seen many successful designers graduating from the school, including Shawn Lee, 22, one of the top three winners of Malaysian Official Designer Association (MODA) Samsung Innovation Awards 2016, who is now working along with our very own Malaysia Catwalk Guru – Benjamin Toong, on a series of collection for RUNWAY Model Search Malaysia 2016. Ang Tong Yin, Dean of INTI Center of Art & Design explained the idea behind the theme and the work put in by the students. “The theme, UNRAVEL, define the event of presenting the designers’ creative thought process, design solutions and creative passions through their final collection. They will soon become professional designers and will be instrumental in changing the fashion industry in our country. The 15 INTI Diploma in Fashion Design students with their models at INTICHANGE 03 Fashion Show. The creative works of these students were judged by Justin Yap, a Malaysian Fashion Designer with his own brand called Justin Yap Atelier for bespoke bridal, evening wear, menswear, shoes and accessories; Nurita Harith, a ready to wear and bridal wear Designer and Yun Wen Lai, General Marketing Manager of Pavilion Kuala Lumpur. Held at new retail landmark, Pavilion Elite, Kuala Lumpur, where Pavilion Kuala Lumpur is the venue sponsor, the fashion show was graced by Khoon Hooi and Amir Luqman who are notable figures in the Malaysian fashion arena; Lyn Loh, Cultural Advisor of Switzerland Embassy Malaysia and Kong Suan Ai, Director of Marketing of Pavilion Group. The other sponsors are Character International Modelling Academy & Agency, E.O Studio, Demomentz, BloomThis, ZALORA and Eleusis by Celine Ooi. Three students were awarded the INTICHANGE 03 Best Design Awards based on different categories. The Best Design Award for Creative & Innovative Design was won by Anis Sofhea Widuri, 21; Best Design Award for Ready to wear collection by Lily Farisha, 22; and Best Crafted Design award went to Elaine New, 27. One of the winning designs showcased includes La Gaiete, an original design by Anis Sofhea Widuri who was inspired by the artwork entitled ‘Dance’ by French painter, Henri Matisse. “La Gaiete is a vibrant collection made with saturated colours of pink, yellow, green and blue. The bright colours expresses the quirkiness in me,” said Anis. ICAD students’ international exposure, innovative learning and individual development are enhanced through participation in many competitions such as ZALORA x INTI Fashion Design Competitions and ANIMAX Costume Design Competition. This is added with practical training with established local and foreign labels such as Beatrice Looi, Khooi Hooi, Monica Quen, Eleusis Bridal, ZALORA Malaysia etc. Empowered with the ability to apply their talent and artistic techniques in the creative process, and to express their ideas in their own distinctive style, ICAD’s graduates can look forward to becoming versatile, adaptable and enterprising professionals that are always on top of the latest trends.